Use the form and book! 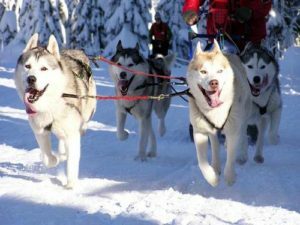 Feel the speed on the ice and snow on this dog sledding tour in mountains. An experienced dog sled guide will answer your questions before whisking you away on an unforgettable dog sledding tour. There are 2 kinds of sledge – on snow and without snow (3 wheel bicycles). 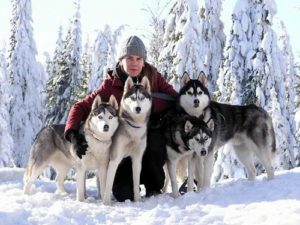 Firstly group is learning about history of this sport, about working with dogs (communication, directions, etc.). 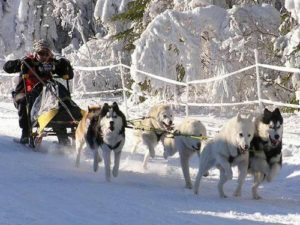 After it muchers make a performance with 4 or 6 dogs in carriage. 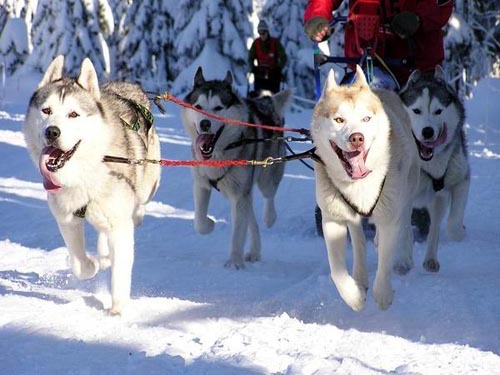 Than each of participants starts alone with 4 dogs as a mucher – approximately 1 km ride per person. Participants receive helmets, bicycles have 2 breaks, sledges too. Average speed is 30 – 45 km/h/it is like riding a bike, just a little bit faster/. At the end we make bonfire and sausages with mould wine, we also taste bitter/sweet vodka.